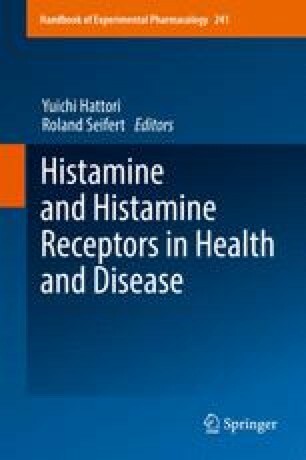 Histamine plays an important role as a neurotransmitter in diverse brain functions, and clearance of histamine is essential to avoid excessive histaminergic neuronal activity. Histamine N-methyltransferase, which is an enzyme in the central nervous system that metabolizes histamine, is localized to the cytosol. This suggests that a histamine transport process is essential to inactivate histamine. Previous reports have shown the importance of astrocytes for histamine transport, although neuronal histamine transport could not be ruled out. High-affinity and selective histamine transporters have not yet been discovered, although it has been reported that the following three polyspecific transporters transport histamine: organic cation transporter (OCT) 2, OCT3, and plasma membrane monoamine transporter (PMAT). The K m values of human OCT2, OCT3, and PMAT are 0.54, 0.64, and 4.4 mM, respectively. The three transporters are expressed in the brain, and their regional distribution is different. Recent studies revealed the contribution of OCT3 and PMAT to histamine transport by primary human astrocytes. Several investigations using mice supported the importance of OCT3 for histamine clearance in the brain. However, further studies are required to elucidate the detailed mechanism of histamine transport in the brain.